In terms of wind speed, I’m quite sure that Haiyan was stronger at its first landfall over Samar island (if that counts as a landfall), and possibly at the second landfall over Leyte island as well. In terms of pressure, Mangkhut was more likely to be deeper due to it having a larger circulation and concentric eyewall structure before landfall, as well as a lower ambient pressure due to a less stronger ridge. For Haiyan, I’m quite sure pressure had risen to above 900mb by the time of the second landfall. September 2018 was marked by the ferocious strike of severe typhoon Mangkhut which necessitated the issuance of the No. 10 Hurricane Signal in Hong Kong for 10 hours on 16 September. This is the second longest duration of No. 10 Hurricane Signal in Hong Kong since 1946, just next to the record of 11 hours set by Typhoon York in 1999. Mainly attributing to the rainfall brought by Mangkhut, the month was wetter than usual. Super Typhoon Mangkhut tracked northwestwards on 14 September and made landfall over Luzon in the small hours of 15 September. After crossing the northern part of Luzon, Mangkhut continued to track northwestwards quickly across the northern part of the South China Sea on 15 September, edging towards the coast of Guangdong. Mangkhut weakened into a severe typhoon on the morning of 16 September and skirted about 100 km south-southwest of Hong Kong in the afternoon. It made landfall over the vicinity of Taishan of Guangdong before dusk and moved into western part of Guangdong. Mangkhut degenerated into an area of low pressure over Guangxi the next night. The storm surge induced by Mangkhut resulted in unusually high water level in many parts of Hong Kong. The water levels at Quarry Bay of the Victoria Harbour rose to a maximum of 3.88 metres above Chart Datum on the afternoon of 16 September 2018, the second highest since 1954 and only lower than the record high of 3.96 metres above Chart Datum set by Super Typhoon Wanda in 1962. Moreover, the maximum storm surge (above astronomical tide) induced by Mangkhut at Quarry Bay was 2.35 metres which was the highest on record, breaking the previous record of 1.77 metres kept by Wanda in 1962." 1900hurricane wrote: I dug up this post to use the Schloemer equation to solve for minimum pressure. I used the measured 944 mb, the 30 km distance estimated here, a 22.224 km RMW estimate (from JTWC's 12 nm RMW at 18Z), and the 1001 mb OCI also from JTWC's best track. I ended up with a pressure estimate of 892 mb. Backrunning that pressure through KZC yields an intensity estimate of 154 kt. Awesome analysis! However, it looks like Iguig was a bit further away from the centre than I previously thought. Based on the last 1845Z radar frame and JTWC's 290°/18 kt movement estimate I get a 19Z position estimate of 17.92N, 122.03E. That point is pretty close to 20 nautical miles north-east of Iguig. Ok, so after factoring in the new distance (20 nm) along with the new RMW I used above (15 nm), I'm back down to 893 mb for 19Z. Additionally, I tried an 18 nm RMW and ended up with 905 mb. Assuming valid measurements, the stations at 21Z give me a pressure estimate of about 935 mb. That corresponds to a fill rate of about 21 mb/hr with the 15 nm RMW estimate and 15 mb/hr fill rate for the 18 nm RMW estimate. Linear extrapolation back to the 18Z landfall would yield pressure estimates of 872(!) mb and 890 mb, respectively. Personally, the second looks a little more reasonable to me, but this may be skewed by my perception of ultra low pressures. This also assumes linear extrapolation is an acceptable way to estimate the pressure filling. I think I can say with at least moderate confidence that Mangkhut made landfall in Luzon with a pressure below 900 mb though. I may try playing with the iCyclone data later too. I was digging data for Mangkhut just now, and I discovered that an 18-nm RMW estimate is more reasonable. Below is a radar imagery slightly before landfall. Using the scale provided, the eye diameter was around 25 nm, which would yield an RMW estimate of 18-19 nm based on the rule of thumb that RMW is around 75% of eye diameter. Instead of working backwards from an estimated pressure at 19Z, I've tried to make an estimate directly using the Schloemer equation. The radar imagery at 1740Z posted above provides the basis for my estimate. At 1740Z, the center is located by radar at around 17.88N 122.40E. At that time, Josh was located at 18.251N 121.815E (i.e. he was approximately 75km away from the center) and recorded a SLP of around 959mb. 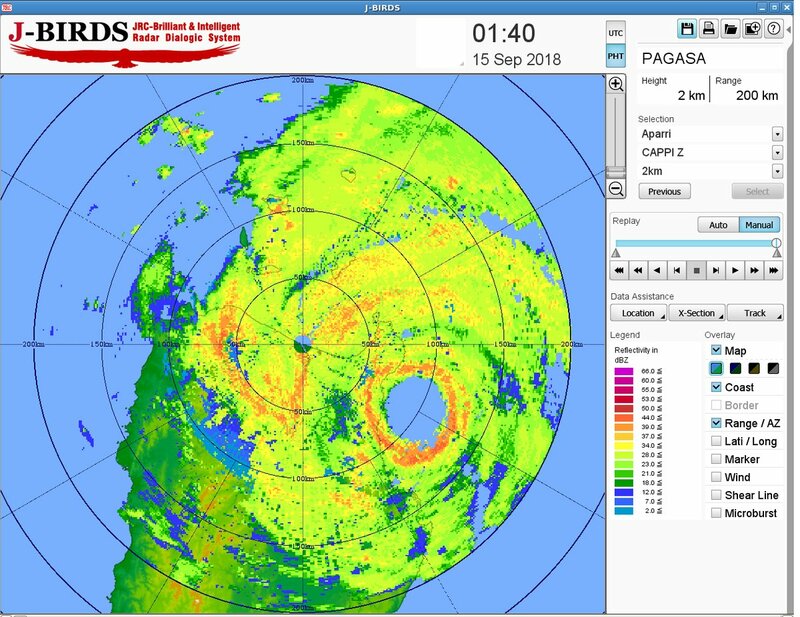 The eye diameter is around 47km, yielding an estimated RMW of 35km based on the rule of thumb mentioned in the previous post. The JMA surface weather map suggested a POCI of 1004mb, while the JTWC working best track said 1001mb. Putting all the inputs into the equation, I obtained an estimated central pressure between 885 and 890mb. This is consistent with the estimate made by @1900hurricane. SconnieCane wrote: Deeper than Haiyan (officially) yet nowhere near as impressive a CDG ring. Dvorak isn't everything, I guess. I still think 895mb peak for Haiyan is not low enough. Haiyan was much lower in latitude and had a large ridge just to the north, so it was more like Irma in terms of its environment than Katrina or Wilma. That said, I'd guess Haiyan had winds considerably stronger at peak.